This meal really should be called “Chicken Caesar Salad on Top of a Warm Naan Bread” but that’s not what my cafeteria at work calls it. The other day I heard someone order a salad pizza at work. For those of you that are new here, (welcome!) food blogging is not my full time job although some days I wish it was. I’m in-house counsel (attorney) for a corporation. Anyway, I thought that I was going to see a traditional pizza with sauce, cheese, and some sort of salad concoction on top. I was surprised to find that I was completely off. That’s a good thing I think because that doesn’t do anything for me because I don’t like the texture of hot, limp lettuce. 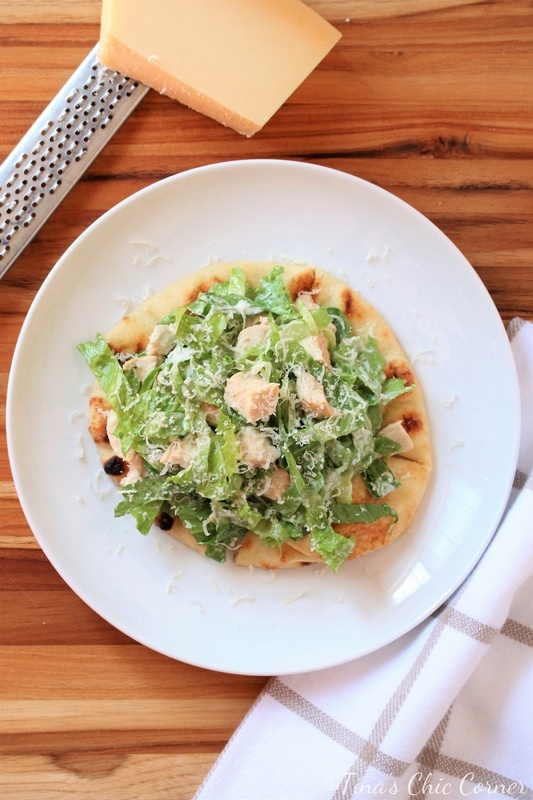 I saw the chef warm up a slice of Naan or pita bread in the oven, take it out and then top it with chicken Caesar salad. It smelled amazing and that was a concept I could totally fall in love with. I simply had to try to mimic this idea at home. I’ve had it for lunch almost every day this week so needless to say I love it. The “real title” is simply too long for me to say and ever since hearing the cafeteria chef call it salad pizza that’s what I call it. 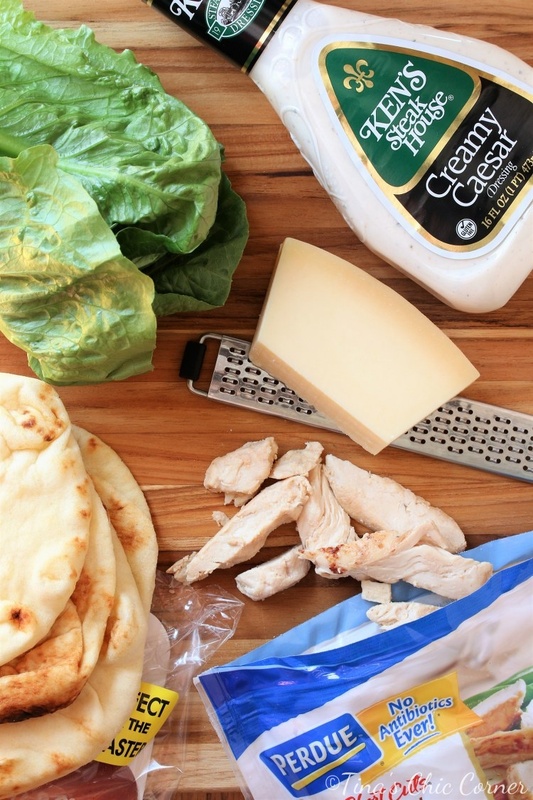 On the note of possibly making things at home, you could try to make the salad dressing, grow the lettuce, or bake homemade Naan too. I’m going to stick to my guns and stay fully lazy. As you have probably noticed from the pictures, it doesn’t really look like a “pizza” which also means that you can’t really eat it like one. In other words, get your fork and knife handy. Get ready to be obsessed for a new lunch. 🙂 Power tip, it really helps when you warm up the Naan and put it under the salad. It melts some of the parmesan cheese and the warmed up dressing seems to add a flare of magic that is just missing if you eat the whole thing at refrigerator temperature. Note: I did not use measurements on purpose because the proportions should be what you like. Picture making a pizza or a salad where everyone likes it their own way. In a bowl, add the chopped lettuce and sliced chicken breast. 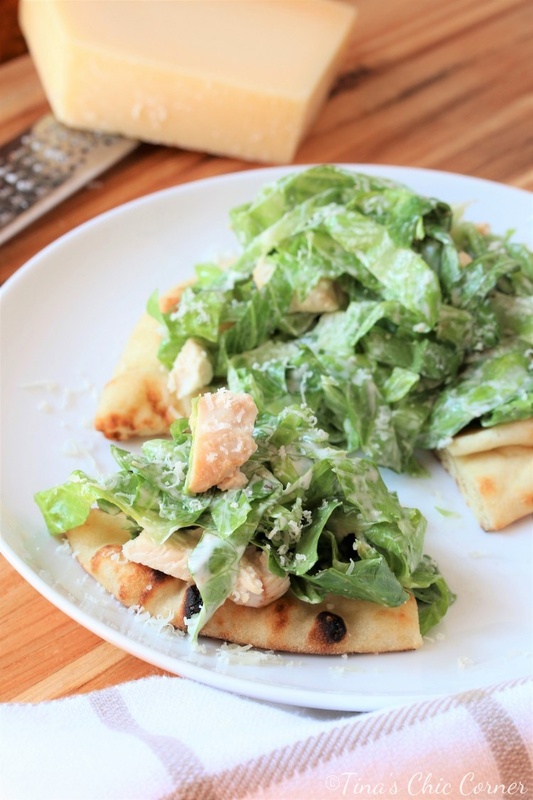 Pour in the Caesar dressing and toss everything together. Set the salad aside. Warm up the Naan bread in a toaster oven or microwave. Place the warm Naan bread on a plate. Add the salad on top of the Naan bread. Sprinkle grated fresh Parmesan cheese on top. You know I will be making that tomorrow for lunch, how quick and easy is that. Thanks Tina. One question, do you heat up the chicken before you toss it with the other ingredients? I think you will love it. I’ve had the chicken both where it’s cold or hot, depending on my mood. As long as chicken is cooked (of course) I think it’s a matter of preference. Yum! 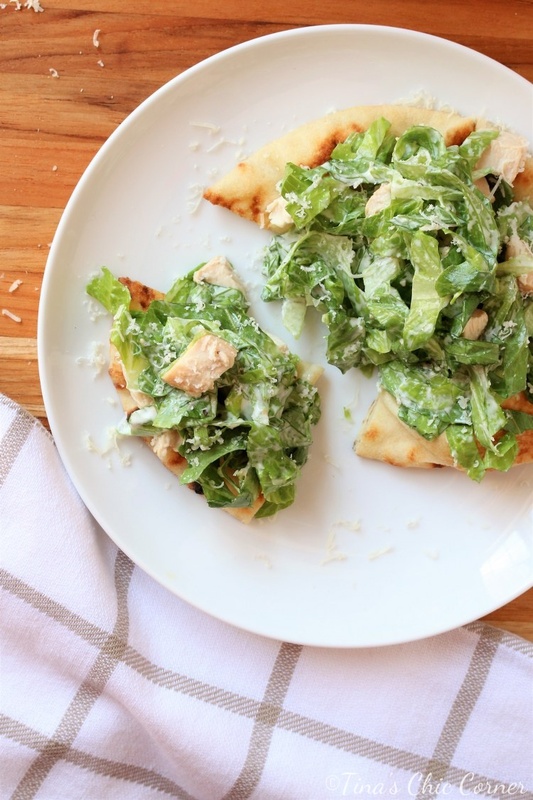 Your Margherita Naan Pizza is one of my favorite quick dinners. Will definitely give this a try. Thank you so much! Let me know if you guys end up trying it.